This is how our forebears were meant to think of witches: they must despise them; they must shun them, as they would an ogre or the Prince of Darkness himself. Anti-witch propaganda was as subtle as the bluntest of cudgels. Women cavorted naked in clumsy woodcuts with horned demons. The women were often hook-nosed, always up to no good. The stories of witches – at Pendle, and Salem, and wherever else the trials were held – reveal wild estimates of the witches’ magical abilities. They carry all the strangeness of the lore of the mid sixteenth century – women able to assume other shapes, to curse and kill, to create potions which could change lives permanently, for good or for bad. They leave an unsavoury taste in the mouth, and they are meant to. For a witch could be a scapegoat for the intolerable, the incurable and the unexplainable. There have always been women who dabbled in the unexplained, who learnt extraordinary algorithms at their mother’s knee and continued to practice them when they grew to adulthood, because, well, they worked. And we must peer very carefully through the myths to the person who once stood at their centre. Strip away the bigotry and examine what is left. Let us put a witch on trial. Cardinal Wolsey – that notorious power-player for Henry VIII – was the subject of a prophecy by a strange creature who, though she looked the very image of what a witch should be, managed to cheat the gibbet, and the torture and cruelty that preceeded it. No one’s quite clear exactly when Ursula Serail was born. I’ve heard 1486. And she died peacefully in 1561, at the height of witch hunting. Her mother, Agnes, was the poorest of the poor in Knaresborough, a barely fed waif who like so many others found herself pregnant with no father to be found. Yet Agnes had a string to her bow. She alleged that Satan himself came to woo her; that he showed her a magnificent vision of his palace and all that could be hers. And she was his utterly. The townspeople were predictably terrified and shunned her; but nor did they torment her or torture her. The young woman fled to a cave outside town and died in the act of childbirth. They found the child next to her, a strange, deformed creature, who nevertheless found a devoted foster mother in the village. And she stayed devoted, legend says, despite regular – and at the same time most irregular- paternal access arrangements. Satan would wait out in the garden for the child, and the little gargoyle playing on the kitchen floor would cackle as objects flew unbidden through the air at his behest. One day baby and cradle were missing and on ransacking the house, were found three feet up the chimney. At school, she distinguished herself: highly intelligent or enchanted, she took one look at the alphabet and knew each letter: there was not a book which could baffle her. And then she began telling people the future. While it does not seem the wisest of strategies in those witch-sensitive times, she got away with it. Although her prophecies were messed about with by a nineteenth century writer, her original ones seem all to have been fulfilled by the middle of the seventeenth century: among them, apparently, the fall of Cardinal Wolsey in 1530. Marrying a carpenter called Shipton, she became known as Mother Shipton. She foretold the time of her own end, lying on her bed to await Death because, of course, witches get prerefential terms. No witch hunter dared come near her: she must have been quite a presence. So now; crane through the mists of folklore which tell you fantastical things about what she was. Shed the wild extemporisation of generations. And you will be left with Mother Shipton herself. Time to deliver your verdict. Posted in Quirks of HistoryTagged folklore, Mother Shipton, witch trials, witchcraftBookmark the permalink. That is a good question. One wonders if the mythical version of a witch ever really existed – one deliberately allied with evil forces to carry out evil? How many actually had proven supernatural abilities? And how many were simply skilled in natural lore? What is ironic is that if the women had the skills and powers they were accused of wielding, they would have dealt most easily with those who accused, captured, tortured, tried and executed them. I did stop fleetingly to wonder how she escaped the witch hunts, Col: one who looked so hideous and was so obviously very different. Could be she was one of those everyone was far too scared to mess with! Oh, Banno, I’d love to. Is it being released here in the UK? Mother Shipton’s also got a FB page. One quick fix: I’ve heard 1486. And she died peacefully in 1651, at the height of witch hunting. ~ Perhaps 1561? 1561 indeed, Nancy, thank you. All sorted. Gracious: Mother Shipton is internet savvy these days, isn’t she? That’s quite a site she has there! Fascinating Kate. What was it that made her different? Her looks? That her prophecies revealed themselves? Both, I think, Tammy. Different has always bred suspicion, hasn’t it? Better to burn her in effigy than face what is in me. I think that is precisely right, Brett. “Who was she, really?” for starters, someone this coward would avoid, but I’m also glas that the townspeople didn’t harm her. I think those hysterical times were far creepier than the accused. Your post inspired me to research Mother Shipton further. Were you aware that a moth is named after her? I also searched to see if she factored in the etymology of mothership. I discovered that that term dates back to the nineteenth century. Sorry I have not been around much. I’m still working on my Manhattan Project, but I’m very near the finish line. My Mom and her Dad had ESP. Would those be the reason for some of the stories that circulated about people with powers? I believe that some of the “witch hunting” had more to do with greeed: seizing land and money from a woman was easier to do if you labeled her the scourge of the community. 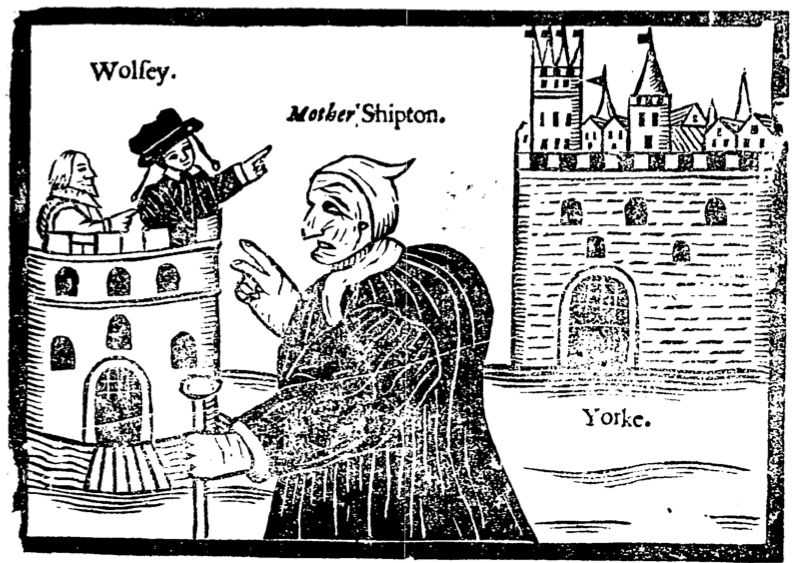 As for Mother Shipton … if the stories are true, I would have given her wide berth as well. Yet another interesting post, Kate, that will have me searching for more on Mother Shipton. Whatever her powers, I am glad she was able to enjoy them and live a long life. So many women like her did not have the same fate. Reblogged this on Selena Writes…. I love just thinking about this, Kate. I wonder about her mother. Her claim to have lain with the devil was a brilliant way to frighten the superstitious and secure her safety. I’ve had wonderful conversations with a friend, a direct descendant of Susannah Martin, burned in Salem. We’ve spoken a lot about how pattern thinkers can appear intuitive to the point of extra-sensory, and in those hysterical times pay with their lives. And yes, all women. I have never heard of Mother Shipton and I am fascinated with her story! Witches are the only religious group that is still widely acceptable to persecute. (See the latest Hansel and Gretel movies for example.) I have often wondered why we put up with it, but I guess the mystique has it’s advantages…Thanks for the great article. Mother Shipton’s prophecy is truly amazing to read today! I looked at Mother’s website, including the gift shop. They have wishing well water in stock, as well as Mother Shipton’s Mugs. I looked for tea towels, but they seem to be out. She was a beautiful woman with raven hair and jade eyes – her power and foretelling of the future were notorious. As she was the balance between good and evil. Only knowing when to use her powers to help heal the ills of society for the common good. I myself don’t believe in prophecies, except for self-fulfilling ones. And I believe in them after the event; that always seems to be the best course. They need to put that witch, the Tooth Fairy on trial. That heartbreaking cheapskate broad never left me more than forty cents. This is why my whole generation became cynics and alcoholics.